Intro: Although a member of the citrus group, it is nothing like any citrus. Do not eat the seeds. History: Originates from Central and South America. Shape: The fruit is round to oval. Weight/size: The fruit are 7.5 – 12.5cm in diameter. 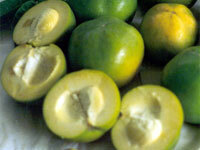 Colour: Thin skinned, green when immature and remaining green to golden when ripe. Taste: Rich sweet flesh tasting like vanilla custard. Buying/storage: Best eaten fresh. Allow to ripen at room temperature. Fruit will be soft when ripe. Ripe fruit is quite perishable, but it may be refrigerated. However, it is best to use fruit as soon as possible. May be frozen whole, as pieces or as pulp. The fruit may be stored in the refrigerator when firm and unripe and then taken out and left at room temperature to ripen. near the skin. It can also be used in milk shakes and sherbets. It is frequently combined with milk to produce ice-creams and milkshakes. With added lemon or lime juice, the fruit makes a good jelly, and also sherbets.